Concerned about ordering the right size? We can help! When you place your order, include a note in the Customer Comments section. You can say "send sizing ring first". We will send you the J095C (pictured below) before we order/ship your ring. You will receive this sizing ring apx. 3 days from the date you place your order. Try it on and let us know if it fits. We will then order your ring. 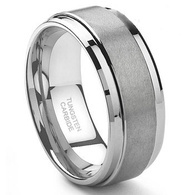 You can also let us know if you prefer the sizing ring in black tungsten instead of silver. This service is free. All of our rings are "Comfort Fit", once you wear a comfort fit ring you will feel the difference! And after a decade of experience, we have found that ring sizing charts/cut-outs/graphs typically do not work well. We recommend you either have your ring finger sized at a jewelry store or let us send you a sizing ring as part of your order. Questions? Call 801-755-1661 or email sales@mensweddingbands.com.